You may not have heard, but Thomas Pock has been complaining about not getting playing time this year. Pock, having been passed by Girardi and Staal on the Rangers depth chart, had been a healthy scratch for every game so far this season and has registered his discontent with the press. Now, I’m not historically a Pock-hater by any stretch. In fact, I don’t mind him at all. His ceiling isn’t that high, but he’s serviceable and you need guys like that in today’s NHL. With my thoughts about Thomas Pock thoroughly explained, please allow me to move on with a brief, plain statement to #22: You, sir, made me miss Marek Malik. You made him look like Mr. Super God Of The Entire Hockey Game. You did this on your very first shift of the season. Impressive. You see, Thomas finally managed to join the fray in Atlanta and immediately got caught out, resulting in the Thrashers first goal. There is nothing that will get the blood simmering like your team’s yappy scratch finally getting some playing-time and instantaneously proving he deserved none. On this particular play our replacement defenseman was caught pinching in idiotic fashion and managed to lose his stick (!) at the same time. After hurrying back in a vain attempt correct his own mistake, he ambled around at the side of the net for a minute before he was handed another stick by a back-checking forward. Just as he seemed to figure out what he was supposed to do with the stick, he turned around and had the puck go between his legs, through the crease to an unguarded Dupuis. It was an unholy display of terrible defensive hockey. Of course, the first goal was followed by "penalties"> to Prucha and Callahan and a 5-on-3 goal given up by New York. Ugh. Suddenly my newfound hatred for Thomas Pock had grown even more acute. I came back from Hawaii for this? I hope Henrik Lundqvist shoves his blocker in your Österreich, Pock. It bears noting that while Pock was blindly stabbing his stick at various pieces of the empty ice (see video of nearly ever Thrashers goal), Lundqvist was All-World. In the 1st period he stopped no less than three breakaways, including one that came after another gaff by Pock. I sincerely hope Thomas likes Hartford. Perhaps he'll earn a standing reservation at the local Applebees or find a nice Nutmeg State girl to settle down with. Regardless, I trust he'll get comfortable there. In the second, the Rangers seemed to find their feet, but they were down 2-0 already and they couldn’t beat Johan Hedberg (who replaced and injured Lehtonen early). Hold that! Nothing will peeve you more than that except perhaps the assclown Atlanta announcers who think the goal was brilliant and ignore obvious infraction. The mites playing between periods have scored nicer goals, Captain Atlanta! It’s good to know that Georgia’s future as a hotbed of American sport is in your homer-blind hands. I hope you get syphilis from Bobby Holik. By the third period I was crying and openly hoping for bloodshed. What on Earth are we paying Colton Orr for if it’s not to take of his skates off and start randomly slashing at people? Come on! These clowns haven’t earned a point all season, they’re cleaning our clocks, and no one lifts a finger? Jesus, Colton, man-up and take a felony for the team. You’re not here for your goal-scoring touch. Of course, even when Hollweg and Orr finally tried to start something (in response to a decent hit on Prucha), Colton was goaded into a double-minor by Exelby. You know things aren’t going well when you lose a battle of wits to the likes of Garnett Exelby. I watched the rest of the game on mute, secretly hoping Malik returns to the line-up on Saturday and cursing Continental Airlines for bringing me back to the dreadful team. After all, they don’t have hockey in Hawaii. Or Austrians. - Credit Lehtonen with some huge early saves on the Atlanta side, particularly just before he left in the 1st period. He was replaced by Johan Hedberg who was equally up to the task. It was a good game for the Atlanta net-minders. - Bryan Little, the Thrashers 2006 1st rounder, seems like a good, gritty goal-scorer. His goal showed a knack for the net. 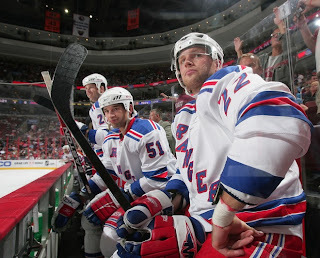 - There is no use hiding it any longer… I love Dan Girardi. I sent him flowers this morning. I hope he likes lilies. - The refs, Dean Warren and Justin St. Pierre, were terrible throughout. I give the credit for being consistent at least. They called an awful, putrid game from start to end and made countless mistakes on both sides. So, you got that going for you fellas... which is nice. Nice recap, New Guy, but you're no Ninja yet. But hey, that Holik thing shows that you might have some promise. Drive on, JP. I'm going to see the Fire Antz play tonight. You work with what you got, right? I didn't think the play was offside. The puck carrier's skates can precede the puck as long as he is in control of it when his skates cross the line. In other words, a player can skate backwards into the offensive end with the puck. tom, that rule applies if the puck-carrier maintains control of the puck as he skates into the zone. And the only reason the puck is behind him in the first place is because he lost control of the puck. In order to be sure I was right I watched the video one more time. Now I'm crying again. Thanks a lot. (NOTE) A player actually controlling the puck who shall cross the line ahead of the puck shall not be considered "off-side". I still don't think he was actually controlling the puck. In fact, I think it was precisely because he had lost control of the puck that his skates (and the rest of him) preceded the puck into the zone. They don't have to maintain control. This is the way this play always happens - the player bobbles it, but is able to reach back and control it before his skates cross the line. It looked to me like he corralled the puck before he got across the line. It was close so I can see how somebody could disagree with my view of it, but I don't think it would particularly upset me if that call went against my team. I get too mad about phantom penalty calls to worry about close offside plays!